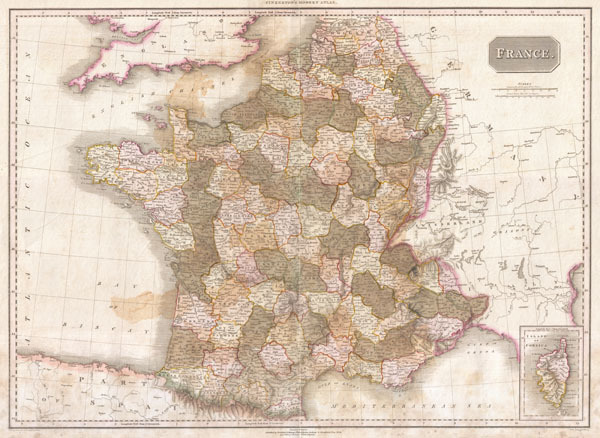 Pinkerton's extraordinary 1818 map of France. Covers the entire country from the Bay of Biscay to the English Channel to the Mediterranean, to the borders with Switzerland and Germany. Drawn shortly after the Napoleonic Wars. Divided according to departments. An inset of Corsica appears in the lower right quadrant. Offers considerable detail with political divisions and color coding at the regional level. Identifies cities, towns, castles, important battle sites, castles, swamps, mountains and river ways. Title plate in the upper right quadrant. Two mile scales, in French Leagues and British Statute Miles, also appear in the upper right quadrant. Good condition. Minor damp staining in lower quadrants. Original centerfold exhibits some wear. Blank on verso. Rumsey 0732.015. Phillips (Atlases) 724. National Maritime Museum, 409.